Born in the year 9 at Reate, north of Rome, Vespasian was the son of a tax collector, Flavius Sabinus and his wife, Vespasia Polla. He joined the military and achieved the rank of legionary commander, serving under Claudius during the invasion of Britain in 43AD. His part in the campaign was significant, for which he was awarded the insignia of a Triumph along with two priesthoods. At 40, he became a praetor and two years later a consul, rising to become African Proconsul in 63. His style of leadership was highly commended as he did not succumb to the temptation of others in authority to abuse their position by taking a portion of the taxes to increase his own wealth. Corruption of this nature was rife in the Roman Empire, as many saw their position of trust as a means to secure a healthy lifestyle. Because of his attitude, he lived modestly by Roman standards and nearly became bankrupt, but was saved by the intervention of his brother. In February 67, he took the post of governor of Judea, where he suppressed the First Jewish Revolt. By the summer of 68, most of the country was again under Roman control. He was ready to take Jerusalem, when he heard of Nero's suicide on 9th June and so abandoned the plans. Then the empire took a sudden turn for the worse, when the new emperor, Galba was murdered in January 69, and his successor, Otho committed suicide in April the same year. Fearing a backlash that would be felt throughout the empire, he formed alliances with Gaius Licinius Mucianus, governor of Syria and Tiberius Julius Alexander from Egypt. Openly the three men hailed the new emperor, Vitellius, but secretly made plans of their own. 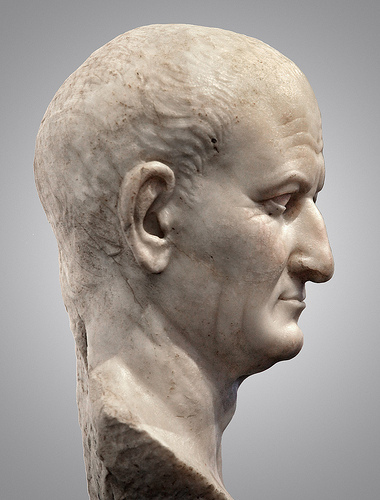 Of the three, Vespasian was the only one who would be accepted to become an emperor. Mucianus was a Jew, and something of a revolutionary, while Alexander did not have any sons. It was essential for an emperor to have at last one heir to the throne, and if there were none by marriage, then they would adopt a son. On 1st July 69, Alexander gave orders to all those under him to pledge allegiance to Vespasian in his attempt to take the throne. The armies in Judea and Syria soon followed in the same fashion, which gave Vespasian a strong following. Mucianus gather about 20,000 troops and began the long trek to Rome with the intention of claiming the throne for Vespasian, who controlled the situation from the eastern part of the empire. The military in Gaul added their support and under Marcus Antonius Primus, they also marched to Rome. Of the two, Primus reached Rome first. There were pitch battles in the streets between those loyal to Vespasian, the aggressor and the current emperor. 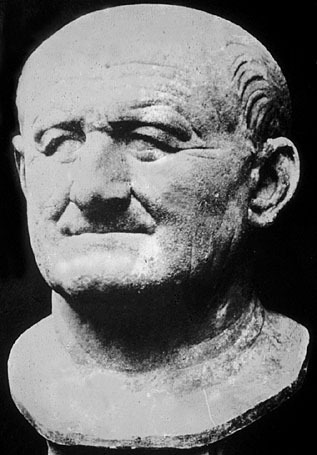 One mistake Vespasian made was to leave his brother in Rome. The emperor's forces seized him and had him slain. This too was a mistake, as he would have been a fine hostage with which to pressurise Vespasian. Undaunted, Primus took Rome on 21st December 69, having captured and killed Vitellians. Mucianus arrived shortly afterwards and was angry with Primus for acting on his own without the authority of Vespasian to enter Rome. Despite this indiscretion, Primus was honoured and returned to Tolosa, leaving Mucianus to hold power pending the arrival of Vespasian. During this period, Mucianus carried out a programme of executions of all those who opposed the new emperor, including Vitellius' son. Of those who remained alive and swore allegiance to Vespasian, they were followed and watched to ensure their support was genuine and they did not mix with any dissidents or hatch their own plots. 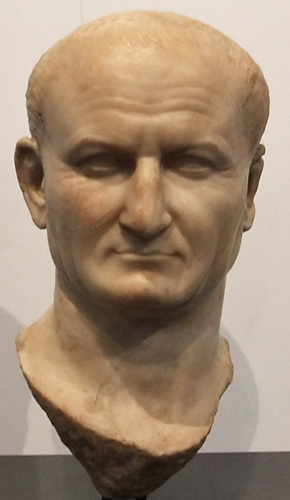 Vespasian finally went to Rome in late 70AD, where he took Mucianus as his personal advisor, but did not allow him to hold any office of power. After such a violent ascension to the throne, Vespasian embarked on a campaign of peace which saw an end to the civil wars. Fighting on all fronts was ended with swift and total victories, which meant Vespasian could now set about reorganising the military. He separated the legions and put them around the empire in small camps to avoid the possibility of them joining in a coordinated attack to topple him. It was now the empire enjoyed a period of peace. The military was not the only possible threat to his rule. the senate too had many members who could cause him considerable torment. So in 74, he took the role of censor among his other tasks which enabled him to have complete control over the senate. The main stumbling block he had to face was the financial state of the empire. After the civil wars of 68-69, the money supply had been seriously eroded and he had to find new ways to raise revenue to fund his plans. Whereas war with other countries gave the Romans new territory, workers, slaves and property, civil war only served to drain the money supply as nothing could be gained in the areas of land etc. This he achieved by raising taxes considerably and cracking down of those who avoided their dues. By now, successive emperors had leaned the value of persuasion over suppression and Vespasian was to demonstrate this by making himself approachable and sympathetic to the people. But eventually, ill health took a hold on the emperor. He knew he was dying and so retired to his home at Aquae Cutiliae, near to where he had been born, and awaited the inevitable. He died on 24th June 79AD.